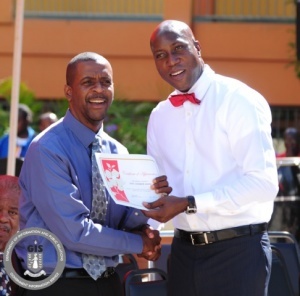 As part of activities to celebrate Culture Day 2014, fifteen culture bearers and six former Ministers of Education and Culture were honored yesterday at a ceremony at the Elmore Stoutt High School. The honorees were recognized for having significantly contributed to the preservation of the Virgin Islands culture through craft work, baking, cooking, dancing, fishing, music, preserving artifacts and serving as all around culture bearers. They are Mrs. Madlene Blyden, Mrs. Cecilia Hodge, Mrs. Marriette Fahie, Mrs. Irene Parsons, Mrs. Cecily Malone, Mrs. Adena Brathwaite, Ms. Shyril Smith, Mr. Owen Smith, Mr. Cromwell Forbes, Mr. Reole “Limping Jack” Frett, Mr. Egbert Donovan, Mr. Austin Freeman, Mr. Philicianno “Foxy” Callwood, Mr. Lincoln Hedrington and Mr. Albato Mactavious. Past Ministers of Education and Culture were also honoured at the ceremony. They include Honourable Ralph T. O’Neal, OBE, Honourable Andrew Fahie, Lloyd Black, Louis Walters, Alred Frett and Eileene L. Parsons. Minister for Education and Culture Honourable Myron V. Walwyn and the Director of Culture Mrs. Luce Hodge Smith presented the honorees with certificates of appreciation for carrying the torch and for raising up the culture of the Virgin Islands. Mr. Vanterpool recalled that there was a time when there were no banks in the Virgin Islands and one could not to borrow money anywhere. He said persons saved their money at home either by burying it or under the pillows, mattresses and other places. Other cultural presentations at the ceremony included a song by the Elmore Stoutt High School Fungi Band, a skit titled “Whey Them Save Dem Money’ by Yvonne and Millicent and a plait pole demonstration by Mrs. Cecily Malone and her dancers. Remarks were delivered by the Acting Principal Mrs. Sandy Underhill, Mrs. Luce Hodge-Smith and Honourable Myron V. Walwyn. The week culminates today, with a Cultural Parade from the 1780 Lower Estate Sugar Works Museum. It ends at the Noel Lloyd Positive Action Movement Park where a Taste of the BVI Cultural Food Fair will be held in conjunction with the BVI Tourist Board.